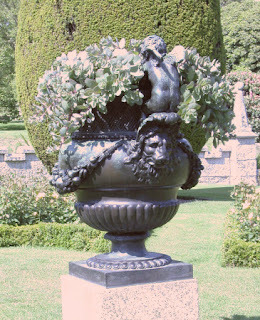 One of a pair of large 18th Century bronze garden urns with semi gadrooned irons above sunburst female masks, flanked by lion mask and ring handles on acanthus supports the lower body with twelve portrait medallions of classical subjects, on bell shaped acanthus supports and square bases. On stone plinth. One of a pair of 18th Century bronze garden urns with gadrooned vines applied with grotesque male masks and swags of fruiting vines suspended from ribbon ties, on fluted columns above a frieze of acanthus; on octagonal bases and fitted with liners. 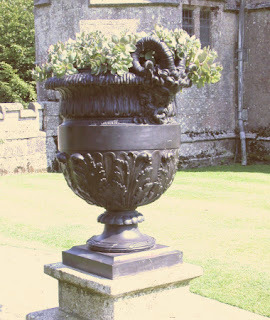 On stone plinth. One of a pair of 18th Century bronze garden urns of bulbous shape, with basket work frieze and handles in the form of cherubs seated on lion masks and rings, the sides with swags of fruit and acorns, the lower part with gadrooned decoration on square boxes. 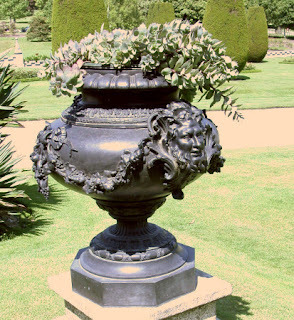 One of a pair of 18th Century bronze garden urns profusely decorated with panels of acanthus foliage, having scrolling lion mask and ring handles; on tapering column and square base. On stone plinth. 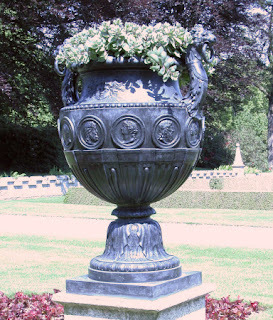 One of a pair of 18th Century bronze garden urns profusely decorated with panels of acanthus foliage, applied with bacchanal masks, fitted with liners; on tapering column and square base. 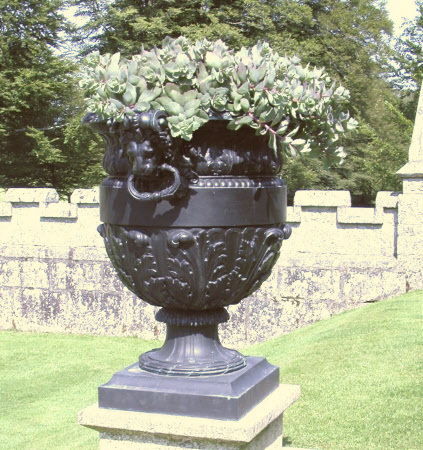 On stone plinth.